is quite messy. I can’t seem to get a routine in place for cleaning the chalkboard and beating the erasers, you know like we used to do in elementary school for our teachers. Occasionally, the girls get wet washcloths and wash it, but they are too short to reach very far. 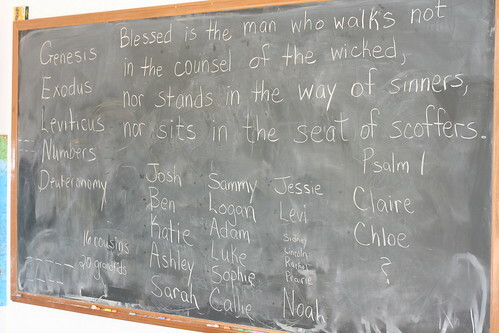 The chalkboard on this day covers Bible memorization, history and grammar (which includes learning the family relations). We are loosely, loosely following First Language Lessons at an accelerated pace. Next Post For my sister . . . . . . .